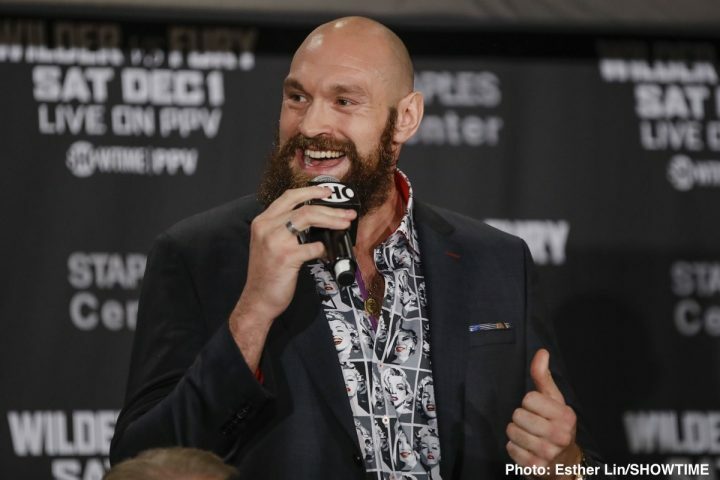 By Tim Royner: Top Rank promoter Bob Arum says that lineal heavyweight champion Tyson Fury’s next fight on June 15 will be announced this Saturday during the Kubrat Pulev vs. Bogdan Dinu heavyweight clash on ESPN, according to Lance Pugmire. If boxing fans want to hear the announcement live for the next fight of former IBF/WBA/WBO champion Fury (27-0-1, 19 KOs), they can tune in and hear it live on ESPN. Fury’s June 15 fight will take place a the Thomas & Mack Center, in Las Vegas, Nevada. It’s ingenious of Top Rank boss Bob Arum having the news of Fury’s next fight being announced during the Pulev-Dinu broadcast on ESPN, since that’ll get a few more boxing fans interested in watching the card in order to hear about Fury’s next fight. With that said, Fury isn’t a popular fighter in the U.S, so it’s not going to interest the masses to want to watch the aging 37-year-old Pulev (26-1, 13 KOs) fight a guy that was knocked out in the 4th round in his last fight in Bogdan Dinu (18-1, 13 KOs) just so they can find out who Fury is fighting next on June 15. Dinu was knocked out by Jarrell ‘Big Baby’ Miller in his last fight. Why Pulev has been matched up against Dinu rather than a contender that is doing well with their careers is unclear. It’s not compelling television seeing this mismatch. The word is Fury, 30, will be fighting a top 5 contender. Despite that, the options aren’t great for Fury, because the top contenders aren’t going to risk losing their spot for a world title shot against IBF, WBA & WBO heavyweight champion Anthony Joshua for a low money fight against a non-champion like Fury. Of those four, Jennings and Rivas have to be seen as the two that the eventual pick will be made for Fury’s fight. Those are Top Rank fighters. Top Rank is looking to build Fury’s name up in the United States before they attempt to match him against heavyweight champions Deontay Wilder or Anthony Joshua. Fury recently signed a big contract with Top Rank, which is said to be $100 million. It’s a lot of money to be paid for a fighter that the casual American boxing fans have never heard of. Fury’s fighting style isn’t one that many U.S boxing fans will enjoy watching. Fury is coming off of a 12 round draw against WBC heavyweight champion Wilder from last December. Fury was lucky the fight wasn’t stopped in the 12th round when he was knocked down for the second time in the fight. “Just spoke to Bob Arum who asked me to spread the word that the Tyson Fury fight date and opponent will be announced Saturday on the ESPN card from the Orange County Hangar headlined by Pulev. Fury will provide satellite interview,” Lance Pugmire said on his Twitter.